Subconjunctival hemorrhage, or subconjunctival bleeding, is bleeding underneath the conjunctiva. The conjunctiva contains many small, fragile blood vessels that are easily ruptured or broken. When this happens, blood leaks into the space between the conjunctiva and sclera. Such a hemorrhage may be caused by a sudden or severe sneeze or cough, or due to high blood pressure or as a side effect of blood thinners such as aspirin. 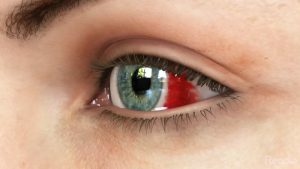 A subconjunctival hemorrhage is typically a self-limiting condition that requires no treatment in the absence of infection or significant trauma. Artificial tears may be applied four to six times a day.